Keep your Nintendo switch protected with this smooth and comfortable carrying case. Your switch will stay looking brand new and free from scratches. Glass material after high temperature steel processing, surface, hardness up to eight – 9 h, impact resistance is strong, not easy and scratches.Long time use, your eyes will not easily fatigue, better protect vision. i miss BAG strap single shoes the demas decia EVERYTHING venia such as the picture. only lacking strap of, everything else came as the product description said. Very good carry case cover. It fits very well and the storage for game cards is awesome. las SCREENS are very quality nice, even tuve smooth lining A tuve They and women’s clothing off a pair 10x To perfect the SCREEN then get my switch no BUBBLES Nothing, the enchanted maletita me ha and las Cases BUTTONS fall shoes perfect. unique vintage failure is COVER joy baby-RED missing you one pair inches apparently To it coat, the other By EVERYTHING excellent. Arrived in good shape. Just installed the protector (top left couldnt do it correctly because I do not know how to install a screen protector) but I still have a spare protector that comes with this package.. amazing value. Theres also a bit of space for additional stuff at the mesh zipper. So I had 2 accessories placed in there. I really suggest this product! Good quality. came send, but зашитные glass broken. frustrating apparently quality they are so do not your money. set excellent. дошёл омска to 1 month 1 week. хорошое quality, smell no. product flawless without any problem and great quality, the grips also are very good, super fast shipping! product matches the image! packaging very well protected! i will back the buy! 21 shipped! outside material quality elastic, заменителем and solid leather! case zipper convenient and easy, smooth rose/open. 14 slots for cartridges порадовало sticks and very taste! quality material inside is very soft, not dust together. in different входили sticks, fuser photo loop 4 satisfied with your purchase! tempered glass notice to more! бракованных 2 2, and comfortable whole. and the latest my входило that, всяки влажны всяких i wipe cloth there is this as there pieces. even just came send, than expected. after unpacking dents saw several cover holster but they are not shipping смертельны переживают all the goods safely-mail …. all невредимо and цело inside was. excellent figment, quality nice, big, highly recommended. Отличный набор, был в пути чуть более 20 дней, с продавцом не общалась. Все как в описании, оба стекла пришли целыми, приклеилось отлично. Силиконовые накладки на джойконы приятные, сидят неплохо. Наушники вполне хорошего качества, интересный дизайн шнура, приятно удивлена. Сумка и вправду имеет довольно сильный запах, но постепенно выветривается, сама же сумка удобная и крепкая. the product is very nice, let’s say the materials are good and everything arrives in good condition, nothing broken or some like that, also good are the shipment times of AliExpress standard shipping is very quick, it takes less than a month to arrive México. Product received today June 21. Fits well. Glasses not installed, got one but come the two of the announce. The thumbs gum are complete. fine joycon but’s bags clip fit perfectly and so on the switch. but it does no embarrassment, there will be just that exceed small toe when it is loose. Good little case for the switch, the tolerance on one of my screen protectors could be improved. All in all a good bundle. 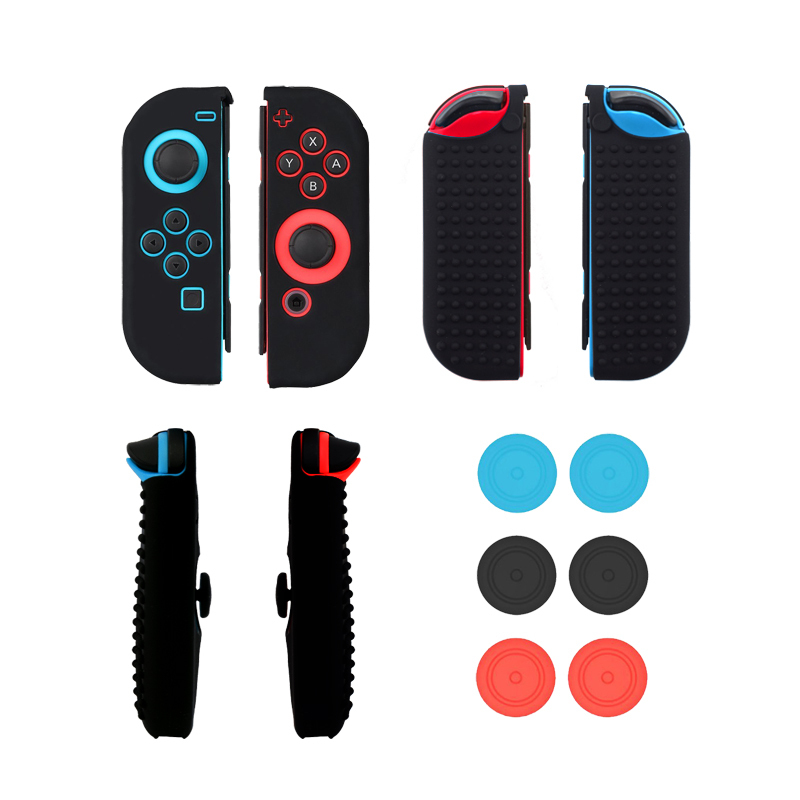 perfect tight, roomy case, войдут and games and headphones, коны джой and additional. 2, immediately приклеел one, become less do not тача чувсвительность. all super, store recommend!